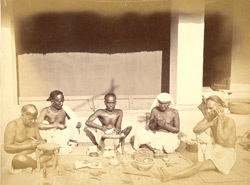 Photograph of a group of five Sonars (goldsmith caste) at work at Cuttack in Orissa, taken by an unknown photographer in c. 1873, from the Archaeological Survey of India. This image may have been displayed at the Vienna Exhibition of the same year. In the exhibition catalogue John Forbes Watson writes: "The Sonar or gold and silversmith is an indispensable member of the Indian social condition of life; and he is to be found in every village, almost in every hamlet, as well as in all towns and cities. In the Deccan, where original national institutions are preserved in village communes, and wherever they are at present existent throughout India - the Sonar is a member of the hereditary village council, which includes the carpenter and blacksmith, the potter, and other useful and indispensable mechanics, and is twelve in number, presided over by the patell, the hereditary magistrate or head manager."